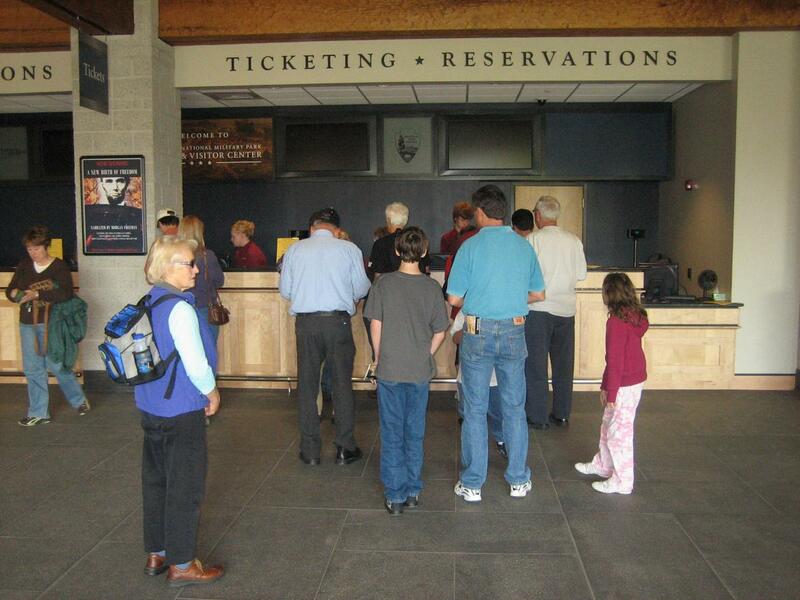 When visitors go to the ticketing desk to purchase tickets, their ticket has a time for a Movie/ Cyclorama show. Whether they want to go to the Movie/Cyclorama or not. This view was taken from the southwest facing northeast at approximately 12:30 PM on Sunday, October 5, 2008. Seemed like a good idea at the time. The new all-in-one fee at the Gettysburg National Military Park Visitor Center includes the New Birth of Freedom movie, the Cyclorama program, and the Gettysburg Museum. This should make a visit to the visitor center pretty simple, right? Wrong. 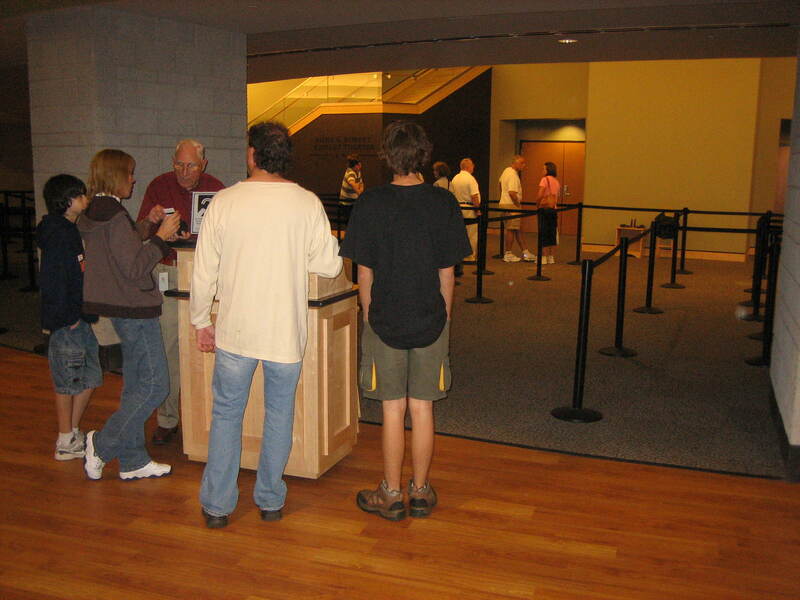 Since this is the first time visitors who want to see the museum collection have been charged a fee, and since the Movie/Cyclorama program is included in the fee, this is presenting a problem. And it’s not a problem of dealing with visitor complaints about being charged for the museum. The bigger problem is the logistics of trying to put everyone who comes into the Visitor Center into a Movie/Cyclorama show. 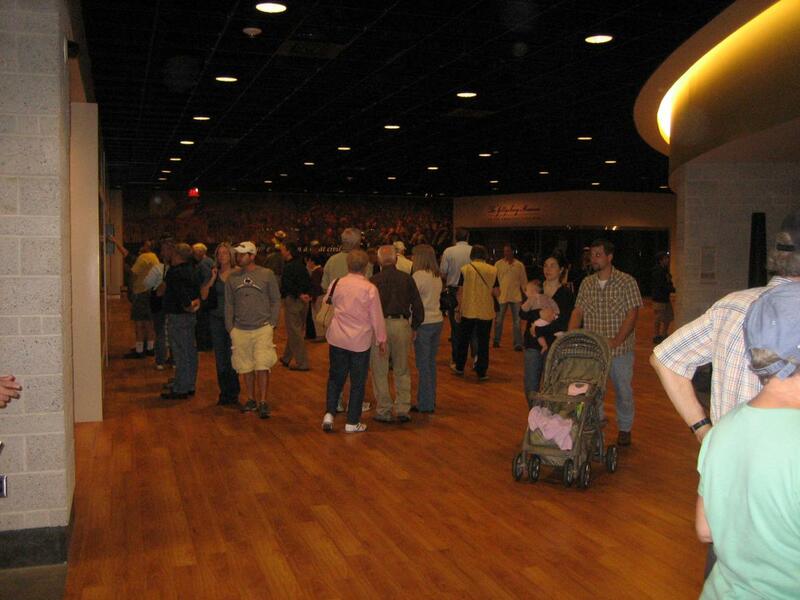 There aren’t enough seats/spaces in the Movie/Cyclorama auditoriums to accommodate everyone coming into the Visitor Center. So this means more people will see the Movie/Cyclorama than ever before. But it also means that shows will sell out, as they did on Saturday, October 4th. By 2:30 PM they had sold out not only many of the earlier shows, but all the shows for the rest of the day. 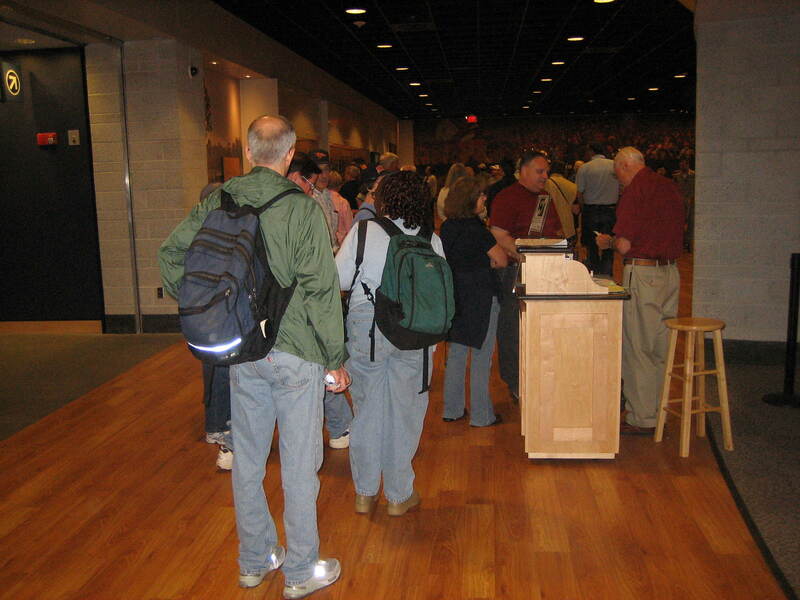 This is the ticket-taking area for the Movie/Cyclorama programs. This view was taken from the east facing west at approximately 12:30 PM on Sunday, October 5, 2008. So you’ve sold all your tickets by 2:30 PM and you’re open until 6:00 PM. What do you do with all those visitors who arrive after 2:30, whose all-in-one ticket will only allow them to see the museum? This view was taken from the south facing north at approximately 12:30 PM on Sunday, October 5, 2008. The foundation decided to sell them Sunday’s tickets on Saturday. That way visitors can see the museum free on Saturday afternoon, but must come back Sunday to see the Movie/Cyclorama. But Sunday morning the Cyclorama wasn’t working. 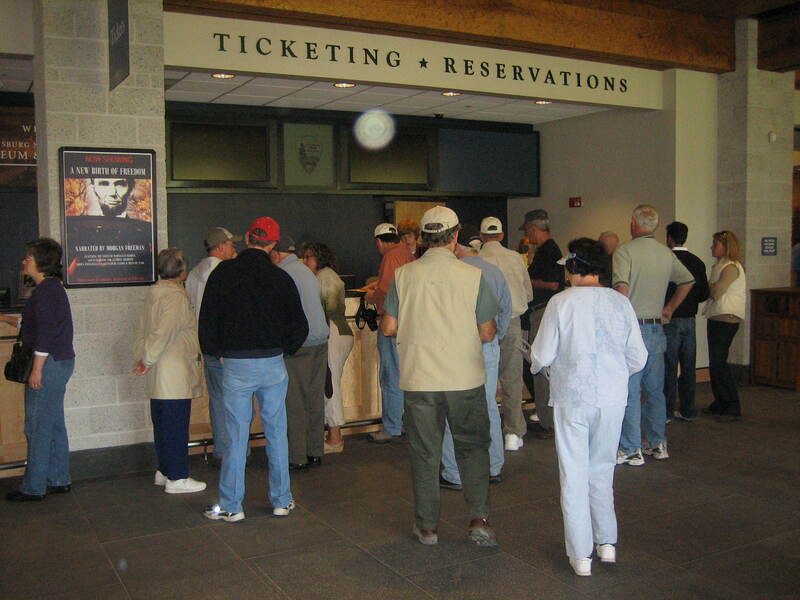 Individuals were paying for the all-in-one ticket but only two of the three venues were available. Here one of the Foundation employees that has to explain to visitors why they have to come out of the movie and can’t go up to the Cyclorama this morning. At this time they were telling visitors that they didn’t know if the program was going to be fixed today or not. It was fixed by the 10:30 AM show. The Foundation began refunding the full fee if the Cyclorama wasn’t working. How did this help them make money? This view was taken from the south facing north at approximately 9:30 AM on Sunday, October 5, 2008. So this brings up a couple of questions that a visitor might have. What if I’m not going to be here tomorrow? Aren’t they “ripping me off” by charging me for something I can’t see? What if I bought a ticket at 2:30 and I really didn’t want to wait around to see the last show that gets out at 6:00 PM? What if I bought a ticket and there are technical difficulties with either the film or the Cyclorama? Should I be charged the full price if I am not able to see everything? Again, the Foundation began refunding the full fee. 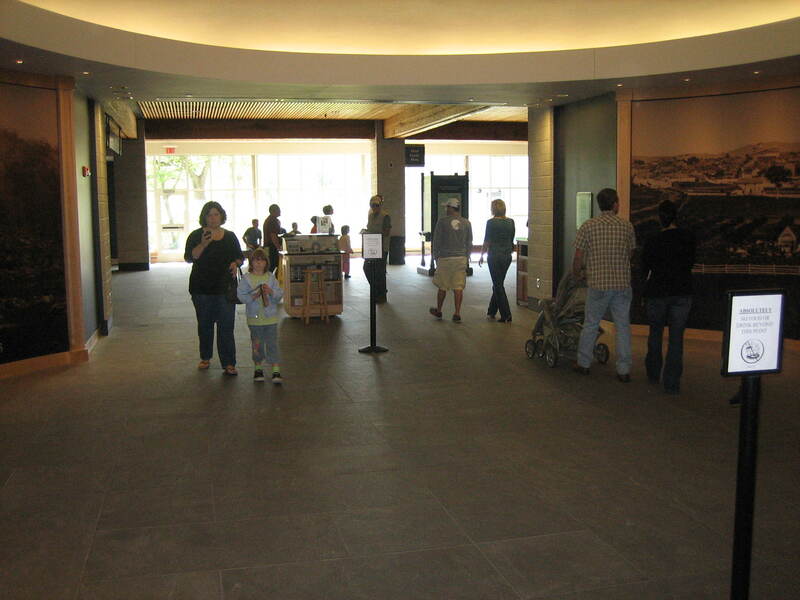 However, visitors who only wanted to see the Museum were charged $7.50 with a separate Museum Ticket. We thought there were to be only all-in-one tickets. So those people were charge the same price just to see the Museum as people who were able to see the Museum, Movie, and Cyclorama. 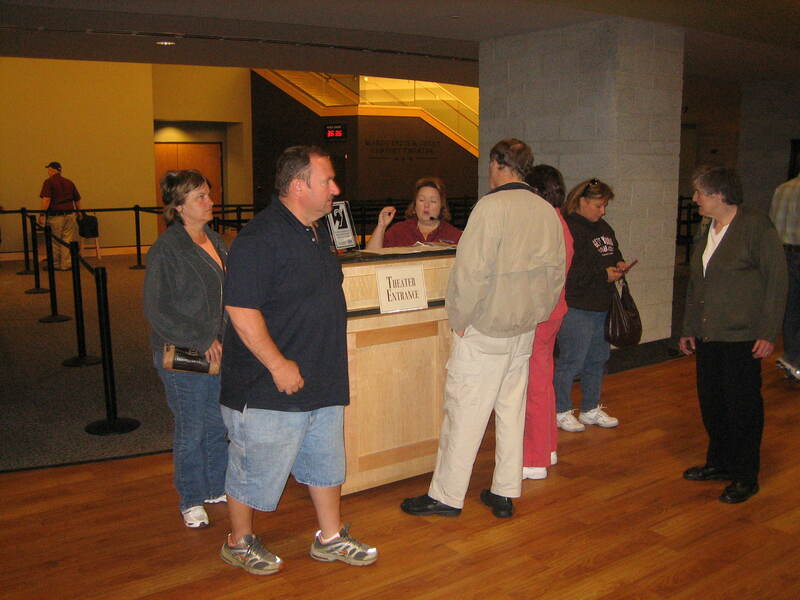 Here another Foundation employee is attempting to explain to visitors that they will be able to exchange their ticket for a later Cyclorama show, if they get it working today. This view was taken from the southwest facing northeast at approximately 9:30 AM on Sunday, October 5, 2008. And what about those who were willing to pay the all-in-one price because they knew that if they didn’t see much of the Cyclorama the first time, they could go back to see it again? Visitors are told that if they take their original ticket stub back to the information desk, they’ll be given a ticket for a new show. But now they can’t if all the shows are sold out. Also, visitors going back to see the show again for free fill up shows much faster. This keeps paying visitors from acquiring tickets to see the show. 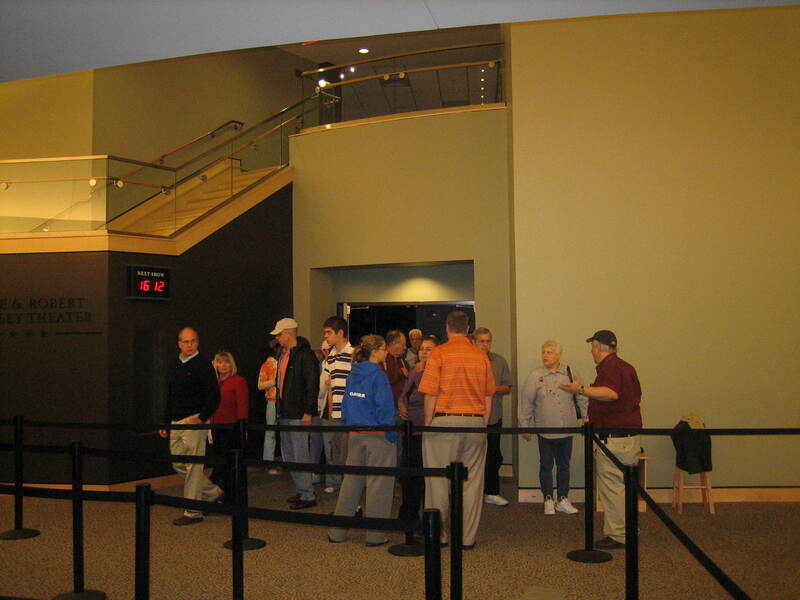 Here is the way visitors must go back to the information desk to exchange tickets for a later show, if there will be a later show. This view was taken from the north facing south at approximately 9:30 AM on Sunday, October 5, 2008. While these logistics may currently be a problem only on the busy fall weekends, what’s going to happen this coming summer? Every day during the summer is going to be busy. Do you just keep selling tickets ahead of time until you’ve sold out a week or two ahead? This view was taken from the southeast facing northwest at approximately 12:30 PM on Sunday, October 5, 2008. So this is all pretty easy to understand isn’t it? Stay tuned. The solutions they come up with to fix this should be pretty interesting. This view was taken from the east facing west at approximately 9:30 AM on Sunday, October 5, 2008. 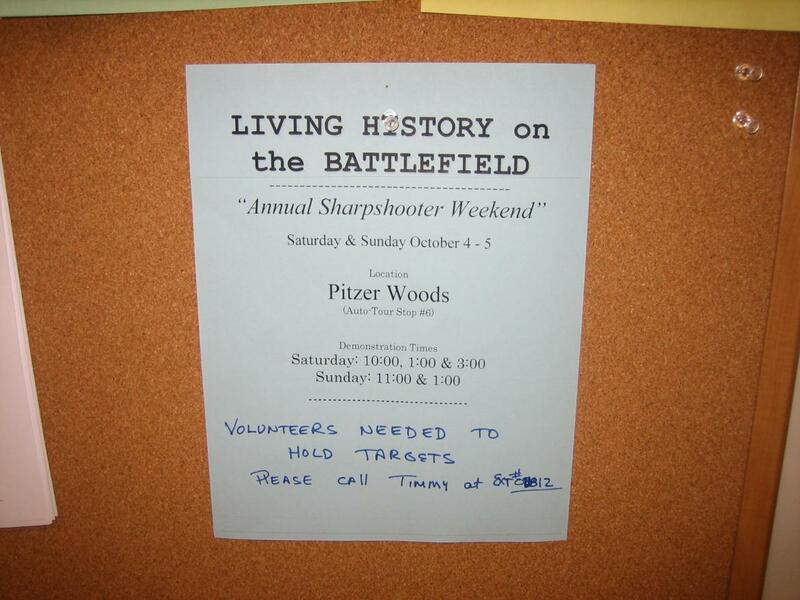 This has nothing to do with the subject of today’s post, but we thought we’d show you some Licensed Battlefield Guide comments on a notice of one of the Living History programs going on in the park this weekend. This view was taken from the north facing south at approximately 9:30 AM on Sunday, October 5, 2008.